In Starved for Science, Wellesley's Robert Paarlberg, below, says prosperity in Africa depends on much-needed agricultural technology. WELLESLEY, Mass. 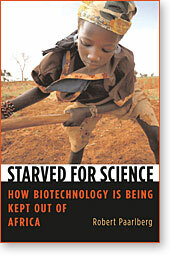 — Starved for Science: How Biotechnology Is Being Kept Out of Africa (Harvard University Press, March 2008), by Wellesley College professor of political science Robert Paarlberg, confronts the sad fact that people in Africa are poor because their labor as farmers has not yet been improved by science, including modern biotechnology. Paarlberg says that agricultural science has fallen out of fashion in rich countries, even though the prosperity and productivity of farms depends on it, and now, these prosperous countries are telling impoverished Africa, where farms are not yet productive, not to invest in science. 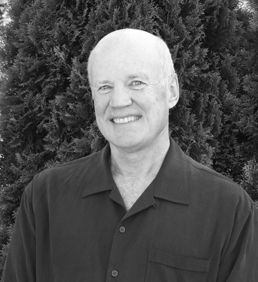 “Responsible biotechnology is not our enemy; hunger and starvation are,” note agricultural scientist Norman Borlaug and former U.S. President Jimmy Carter in the foreword to Paarlberg’s new book. “Without adequate food supplies at affordable prices, we cannot expect world health, prosperity and peace.” Borlaug and Carter, both Nobel Prize winners, have worked together for more than two decades toward improving African agriculture. MALNOURISHED FARMERS: Africa’s small farmers are mostly poor, hardworking women. They have no improved seeds, no chemical fertilizers, no irrigation. With their meager crops, they earn less than a dollar a day. Many are malnourished. Why has this impasse come to be? Science in agriculture, Paarlberg says, has gotten a bad rap in rich countries because it is associated with excessive chemical use. But in Africa, farmers are using too little fertilizer, rather than too much, which is one reason crop yields in Africa are only a tenth as high as in the United States. On a per-capita basis, Paarlberg notes, Africa produces 20 percent less food today than it did 35 years ago. WITHHOLDING HELP: Modern crop biotechnology is not reaching farmers in Africa because governments there, following the regulatory practice of European countries, have not made it legal for such crops to be planted. “New risks to human health or to the environment are not the explanation, since no such risks have yet been documented,” Paarlberg argues. Critics of genetic engineering in Europe ignore the published judgments of their own national academies of science and medicine showing no new harm yet from any of the biotechnology crops placed on the market so far. Paarlberg shows that Europeans have rejected genetic engineering in farming not because of a presence of risks but because of an absence – for them, at least – of any compelling new benefits. Farming is already so productive in Europe, and consumers are so affluent, that they can afford to indulge preferences for foods grown in more expensive ways – such as organic foods. Science-based farm productivity, Paarlberg adds, may have become unfashionable in the overfed part of the world, in Europe and North America where farmers are just 5 percent of the population or less, but science is still desperately needed in Africa, where two thirds of all citizens are poor farmers, working without any improved seeds or tools. In Starved for Science, he defends the potential for helping Africa rise out of hunger and poverty through science. Without it, African farmers are hearing the message that, in the eyes of the world, they may as well remain poor.